Dozens of new apartments will be available for rent in the heart of the Strip District before the end of the year, as the Edge 1909 apartment complex begins the next phase of its rollout. The Strip District and Lower Lawrenceville have become havens for technology companies both local and national, earning the stretch of land the nickname Robotics Row. With more professionals commuting to the neighborhood every year, property developers are racing to bring new residences to the Strip. Located at 1909 Waterfront Place, Edge 1909 features 364 one- and two-bedroom apartments. The first 150 units have been available since the summer, and the rest are scheduled to become available before the end of December. Kitchen in an Edge 1909 apartment. Courtesy of NRP Group. 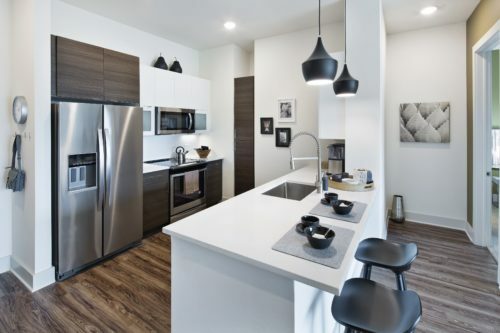 With rents between $1,400 and $2,800, Edge 1909 is only the first in a much larger residential development project from the Cleveland-based NRP Group. In proposals submitted to the Pittsburgh Zoning Board of Adjustment earlier this year, NRP stated its plans to build more than 800 units on the riverfront by May of 2021. While NRP is managing the project, the land itself is owned by The Buncher Company, a local property development firm that is currently building a variety of new, high-end residences and office spaces in the Strip District. Edge 1909 was designed by JDavis Architects to include a wide array of amenities, such as a fitness center, heated pool, ballet barre, resident lounge with a demonstration kitchen, dog play area and washroom, 24-hour concierge and views of Downtown Pittsburgh and the Allegheny River. Take a 360 tour here. The post Edge 1909 in the Strip is now leasing apartments, with more to come appeared first on NEXTpittsburgh. ← Previous What’s the future of Pittsburgh malls? Local experts weigh in.